Dr. Phil McGraw has galvanized millions of people to “get real” about their own behavior and create more positive lives. “Dr. Phil,” his syndicated, daily one-hour series, is the second highest-rated daytime talk show in the nation. The show has been making headlines and breaking records since its September 2002 launch, when it garnered the highest ratings of any new syndicated show since the launch of “The Oprah Winfrey Show” 17 years prior. Dr. Phil uses his get real approach to help guests solve their problems by stripping away their emotional clutter, and providing them with the tools they need to move confidently ahead in their lives. Dr. Phil also champions those who suffer from such silent epidemics as domestic violence, child abuse, depression, racism, substance abuse and other health issues that are prevalent in society, but go largely undiscussed by their victims. Dr. Phil is a New York Times bestselling author. His titles include: “Life Strategies: Doing What Works, Doing What Matters”; “Relationship Rescue: A Seven-Step Strategy for Reconnecting with Your Partner”; “Self Matters: Creating Your Life From the Inside Out”; “The Ultimate Weight Solution: The Seven Keys to Weight Loss Freedom”; “Family First: Your Step-by-Step Plan for Creating a Phenomenal Family”; “Love Smart: Find the One You Want, Fix the One You Got” and “Real Life: Preparing for the 7 Most Challenging Days of Your Life.” Dr. Phil is also the author of the New York Times bestseller “The Ultimate Weight Solution Cookbook: Recipes for Weight Loss Freedom” as well as “The Ultimate Weight Solution Food Guide.” His books have been published in 39 languages with over 24 million copies in print. His latest book, “Life Code: The New Rules for Winning in the Real World,” abandons traditional thinking and tells you the ugly truth about the users, abusers, and overall “bad guys” we all have in our lives. He also reveals the secrets of how they think and how they get to and exploit you and those you love. The Dr. Phil Foundation, a nonprofit charitable organization that is committed to helping children and families at risk, is also devoted to rewarding remarkable children who are working hard to overcome tremendous obstacles and give back to their family and community. The Foundation is another tool in Dr. Phil’s arsenal to fight problems that cripple our society in subtle but undeniable ways. Dr. Phil holds a B.A. from Midwestern State University and an M.A. and Ph.D. in clinical psychology from North Texas State University with a dual area of emphasis in clinical and behavioral medicine. 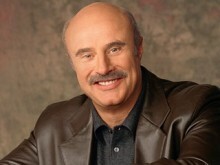 An avid tennis player, golfer and scuba diver, Dr. Phil lives in Los Angeles with his wife Robin. The couple, married for 31 years, has two sons: Jay and Jordan. Do you want to hire Dr. Phil McGraw? Directly request a quote. In 48 hours we can send you the availability of Dr. Phil McGraw If you would like to book Dr. Phil McGraw, Entertainment Booking Agency is the right place. We will offer you the best price and contact the management or we directly contact Dr. Phil McGraw. For corporate appearances or speaking engagements you can contact our agents and the will help you true the process. Tags: hire Dr. Phil McGraw, Dr. Phil McGraw booking, book Dr. Phil McGraw, Dr. Phil McGraw appearances, find more information on booking Dr. Phil McGraw for appearances, Dr. Phil McGraw speaking engagements, Dr. Phil McGraw endorsements/spokesperson, Dr. Phil McGraw appearance fees, Dr. Phil McGraw booking agency contact info, biography of Dr. Phil McGraw, Contact an artist booking talent agent find a speakers bureau that can book Dr. Phil McGraw, speaker booking agency for Dr. Phil McGraw, Dr. Phil McGraw booking agency, Dr. Phil McGraw booking for corporate event. EBA is one of the biggest entertainment booking agencies in the World. We book hundreds of celebrities, artist, athletes and speakers in a year. Important to know is that we are not claiming to be the management of Dr. Phil McGraw. We are not the official agent for Dr. Phil McGraw. Companies from around the globe book these artists and speakers true our company be course we have one of the biggest networks and we always have direct contact with the artist or the management. We help you to find the right celebrities for your corporate of private events. Please contact one of our agents to get free advice and we will help to get the world-famous artist on your party.